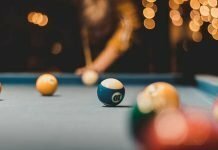 What is Cue Ball Control? If you’ve played against a good pool player at the bar, you’ll notice how they set up each shot by moving the cue ball around the table. They use these same skills to leave you with hard shots after a miss. Although it may look masterful at times, cue ball control is really not that hard. It’s one of the fundamental pool skills all players can learn. There are three primary stroke techniques for controlling where the cue ball goes after it hits the object ball: the draw, the follow, and the stop shot. In this article, we’ll review how to execute each of these strokes, with some additional resources at the end for further reading. And we’ve even included a quick video demonstration for each shot. As you learn how to play pool, try to practice these strokes every now and then. You’ll find that these skills come in handy no matter what type of pocket billiards game you’re playing. 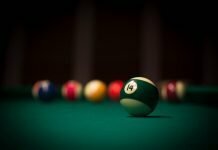 Before we look at draw, follow and stop shots, let’s review the basics of where to strike the cue ball for basic cue ball control. With each of the strokes below, you’ll notice that the we mention hitting the cue ball “above” or “below” center. 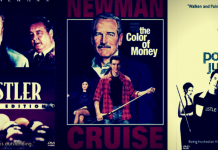 In these examples, “center” refers to the horizontal axis of the cue ball. For the purposes of this article, we are not talking about using “English”, which means striking the ball to the right or left of the vertical axis. Hitting the ball to the right will cause the cue ball to spin left (or counter-clockwise); hitting to the left will cause the ball to spin right (clockwise). This is an advanced technique that influences the path of the cue ball to the object ball, as well as the trajectory of the object ball. English can also change the angle of the cue ball after it hits a rail. It is a very effective cue ball control technique that we will cover in upcoming articles. But for now, we’re sticking with the basics of draw, follow and stop. And, for most of us, staying in the center of the vertical axis will work for the vast majority of our shots. The draw shot is when you want to control the cue ball by drawing it back after it makes contact with your object ball. This a very common positioning shot in pool. The goal is to hit the cue ball low enough to pull its weight backwards. You should aim at least a cue tip’s width below center to execute a draw shot. For more draw, you can aim lower on the cue ball, but usually no more than the width of a cue tip and a half. You can increase the draw by aiming lower or striking with more force. Also, after you strike the cue ball, follow through about 4 – 6 inches past the point of contact and towards the object ball. You will often need to elevate your cue when performing a draw shot. For example, if the cue ball is close to the rail or there is another object ball in front of the cue ball, you need to bring the cue higher to aim low on the cue ball. To do this correctly, make sure you have developed a solid bridge to hold the cue firmly and comfortably. You can easily practice the draw shot by aiming for an object ball and trying to draw the ball back to different distances. Try to draw it further each time. You will get a feel for how low and how hard you need to strike in order to achieve the desired draw. Then try to draw from different distances. You’ll find that a draw shot is harder to execute with longer shots. You’ll need more backspin, which requires a firm strike below center. The follow shot is the opposite of the draw shot. With a follow shot, you are trying to keep the cue ball moving forward after it makes contact with the object ball. This is useful when you need to bring the cue ball down to the opposite end of the table after a shot by, for example, following the cue ball into a rail with some topspin. With a follow shot, you should always try to aim just a cue tip’s width above center on the cue ball. There is usually no need to aim higher. If you need more follow, just add more force to your stroke. Because if you aim too high, you risk losing stroke speed and miscuing. A simple way to practice follow shots is by changing distance the cue ball travels after each shot. You can try short follows first, and then move to follows with a bank. Once you get comfortable, you can try follow shots that will bring the cue ball off the rail to the opposite end of the table. And try different stroke speeds to see how it effects the path of the cue ball. The goal of the stop shot is simply to stop the cue ball after it makes contact with the object ball. OK, so we didn’t stop the cue ball dead in the video. But movement of the cue ball is minimized, which is often the goal when setting up for the next easy shot in a game of eight-ball. It’s not perfect, but it gets the job done. A stop shot should be hit dead center on the cue ball for maximum control. Although some players like to hit a little below center to make the ball slide and stop it in its tracks after it makes contact with the object ball. You should keep the cue as level as possible when executing a stop shot. Also, the follow-through should be about 4 – 6 inches after making contact. And make sure you have enough chalk, as stop shots need plenty of friction between the tip and cue ball. When you first try these shots you’ll need to focus your aim on the cue ball to make sure you strike the ball at the right location. Try to find your aim during your first couple warm-up strokes. Once you hone-in on where you plan to contact the cue ball, shift your aim up to the object ball and the intended pocket. Keep your aim focused on the object ball for your last couple warm-up strokes, and all the way through contact and follow-through. 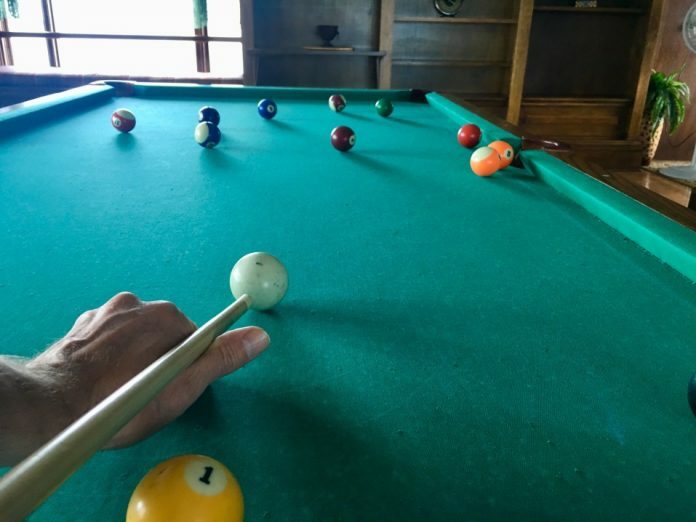 If you practice this technique often, you’ll find that that you can quickly find the correct point of contact on the cue ball so you can refocus your aim on the object ball without fear of miscuing. It does take practice though. 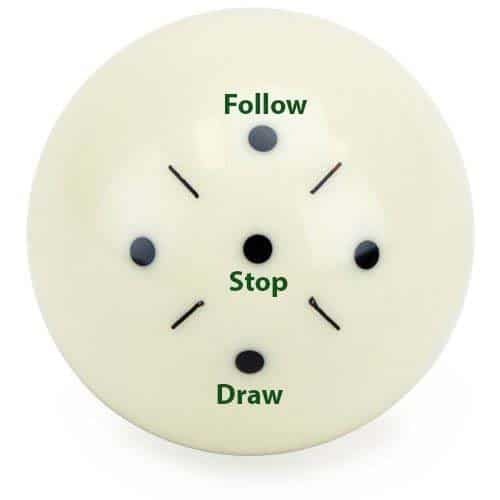 So, there you have it, three ways to control the cue ball during a game of pool: the draw, follow and stop. These basic techniques will allow you to position the ball in better spots so you’re not constantly trying to make impossible shots or leaving your opponents with easy makes. 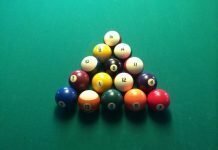 Colorado State Billiards Page on Draw and Follow FAQs: Tons of information with expert tutorials and videos about cue ball control techniques. 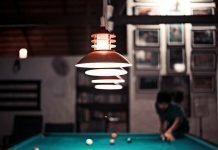 Willie Mosconi on Pocket Billiards: The classic book on pool from the legendary master of pocket billiards, Willie Mosconi. This book is written in an easy to follow style and includes an entire section on “Cueing the Ball”. 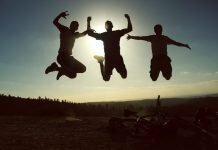 Bar Games 101 is the #1 online destination for learning about all the best bar games to play with your friends and family.